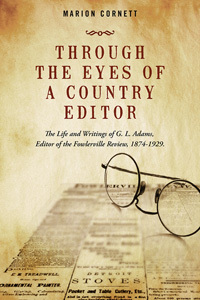 Through the Eyes of a Country Editor: The Life and Writings of G.L. 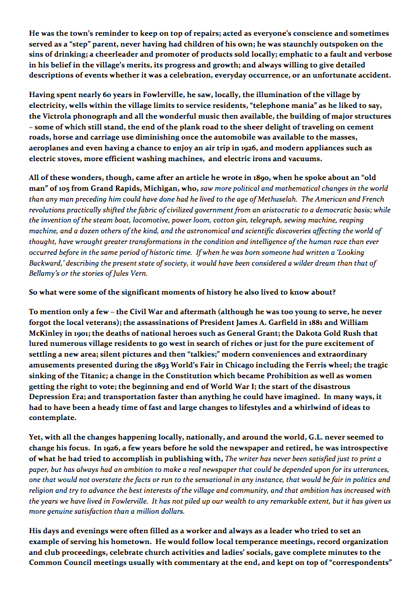 Adams Editor of the Fowlerville Review, 1874-1929. 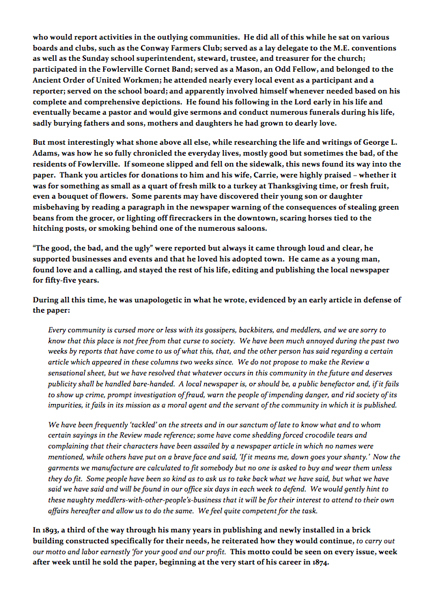 This is an historical work that gives readers an insight into the life of G.L. 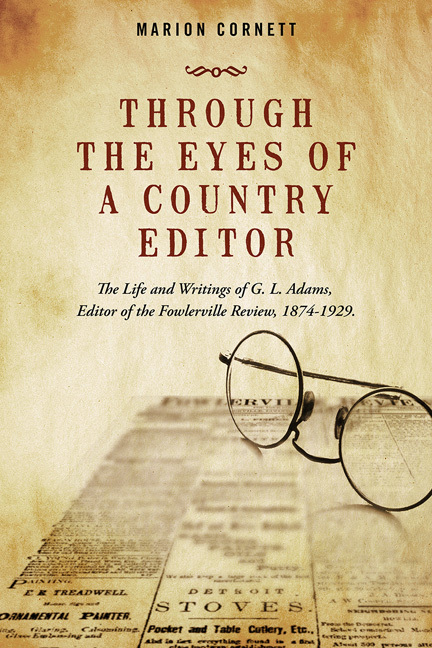 Adams, a young editor of a small midwestern town’s periodical, The Fowlerville Review. Adams found the village of Fowlerville in 1874. He determined that its beginning needed to be chronicled. And so, over the next fifty plus years, Adams put on paper all of the major and minor events that were part of the development of this community—devastating fires, births, deaths, major epidemics, inventions, weddings, and so much more. Adams used humor, flair, and details so that every reader would be able to appreciate the birth and development of the village of Fowlerville, MI. After Marion Cornett settled in Fowlerville in 1996, she began studying the history of this small community. She became fascinated. And the more she read, the more interested she became. Sge became determined to share what she was learning with many not just in this village. 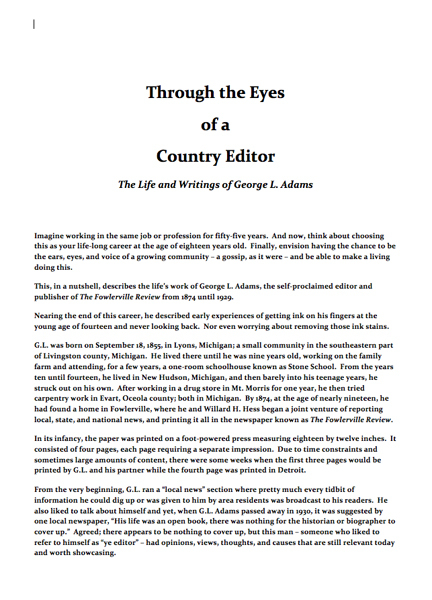 She wanted to share Adams’s story with any individual who would appreciate the gift of this talented editor as he gave a continuous chronicle of the lives of those who built this community. This is the second book by Cornett. her first publication was The Fowlerville Chronicles. She gave readers insight into the hearts and souls of the people of early Fowlerville. 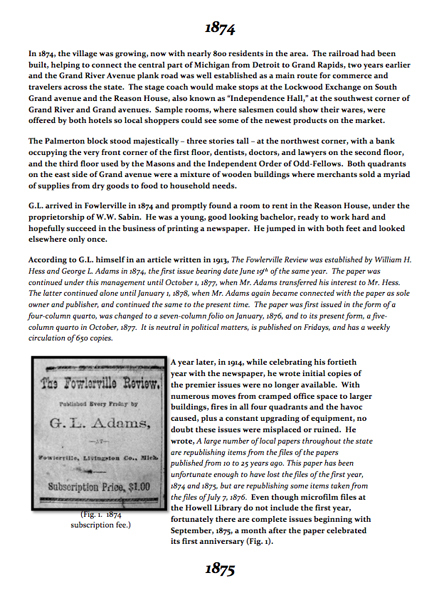 Ms Cornett, as an owner of an embroidery company, has pulled together the stories of the people of Fowlerville and the reports by Adams to produce this second work. Cornett has pulled together the fabrics of history of the village of Fowlerville and developed the beautiful textual/photo designs of this second work.